Is this the successor to the Ferrari 599? 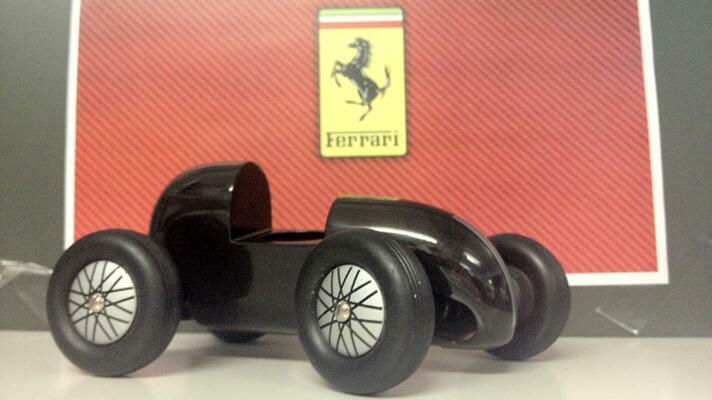 This image, leaked onto the internet by renegade blog site goptear.com, apparently shows a 100 PER CENT ACCURATE wooden model of Ferrari’s next-generation V12 supercar. The grainy cameraphone photo reveals an evolution of Ferrari’s organic design language, with a strong, curved bonnet and distinctive ‘hoop’ on the rear deck. Experts believe that the model’s sleek lines could contribute to radically low drag coefficient, and the ability to roll right from one end of the kitchen table to the other from just a single push. Ferrari also appears to have employed a fenderless, open-wheel design that will surely require modification to pass European safety tests, while the high-profile tyres are said to improve ride quality and lessen the possibility of a child suffering a nasty bruise if the car falls off the toy cupboard onto his head. Though the 599’s successor is not due to be officially revealed until Wednesday, industry insiders have confirmed that TopGear’s leaked photo is an accurate portrayal of the 700bhp super-GT.